Our free online certificate template lets you make and download a printable award certificate in seconds. Just fill in the editable form fields and click the button. Our certificate generator does the format and design work for you. 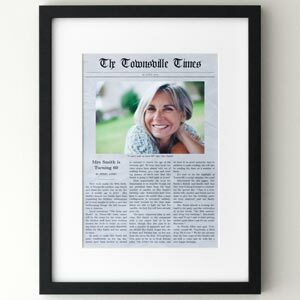 All you need to do is download your beautiful high-resolution award certificate and print it with your home or office printer. When you're happy with how your certificate looks, click "download" to download a high resolution version that will print crystal clear on your home printer. Got a question? Contact me with this handy form. We all know that there are serious and solemn reasons for giving people award certificates. But let's lighten the mood for a moment. 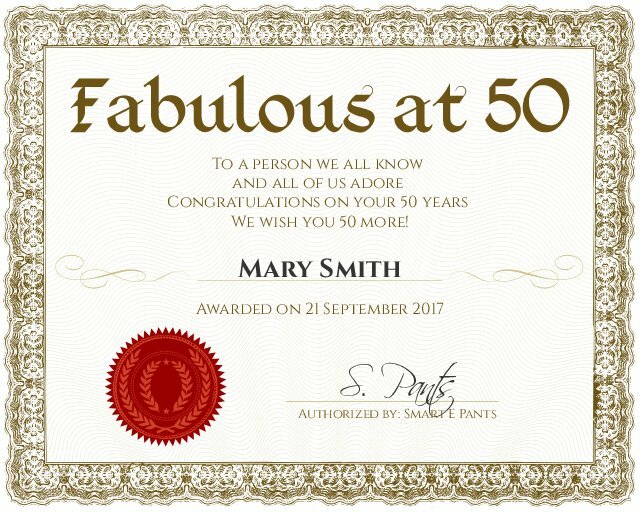 If someone you know is turning 50, 60, or retiring, why not celebrate the momentous occasion with a funny award certificate? Here are some examples to get your creative juices flowing. Officially Over the hill and picking up speed along Old Fart Freeway. Awarded to John "Old Man" Smith and authorized by L Derly (Elderly). If things get better with age, then you're approaching magnificent. 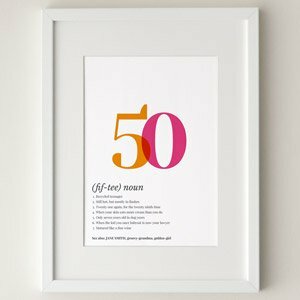 Congratulations or your 50th/60th birthday! Awarded to John "Old Man" Smith and authorized by I P Knightly (I pee nightly). We're all envious of you retiring, but at least were younger! Congratulations on your retirement. Awarded to John "Old Man" Smith and authorized by Jerry Atric (geriatric). 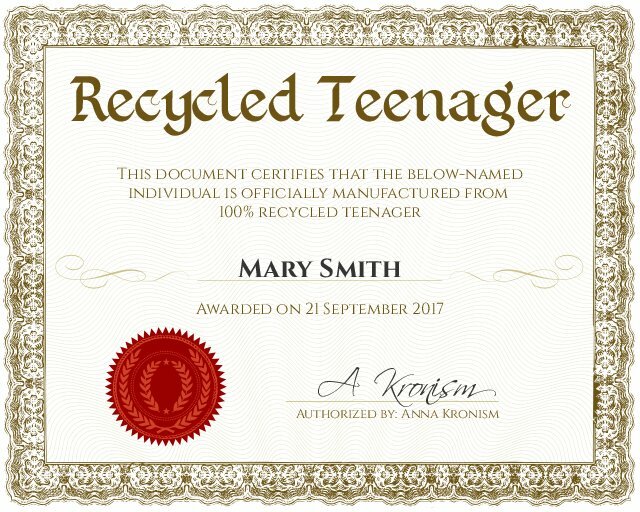 This document certifies that the below-named individual is officially manufactured from 100% recycled teenager. Awarded to Mary Smith and authorized by Anna Kronism (anachronism). The below-named individual has been aged to perfection for 50 years and has matured like a fine wine. Awarded to Mary Smith and authorized by Ivana Tinkle (I want a tinkle). Welcome to the gray brigade. Don't worry, it's not so bad. You're only young once, but you can be immature for a lifetime. Awarded to John Smith and authorized by Arthur Rightus (arthritis). To a person we all know, and all of us adore, Congratulations on your 50 years, we wish you 50 more. 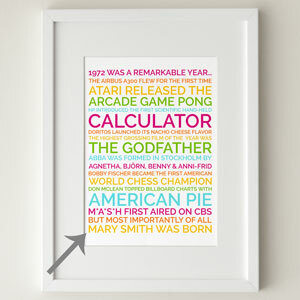 Awarded to Mary Smith and authorized by Smart E Pants (smarty pants). Congratulations on reaching the wonder years... wonder where your car is parked? Wonder where you left your phone? Wonder where your glasses are? Wonder what day it is? 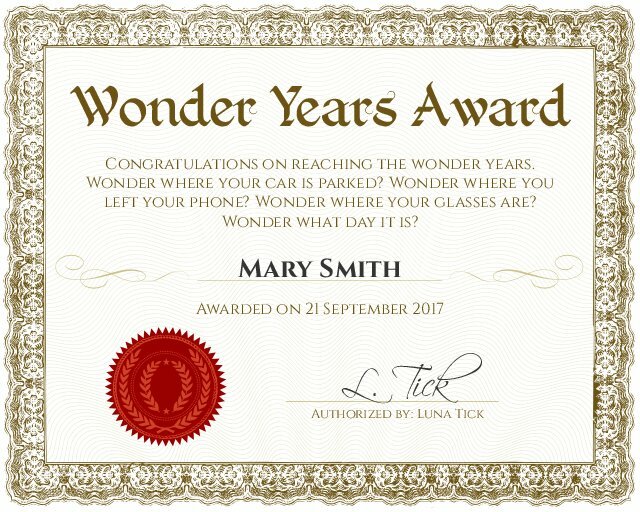 Awarded to Mary Smith and authorized by Luna Tick (lunatic). 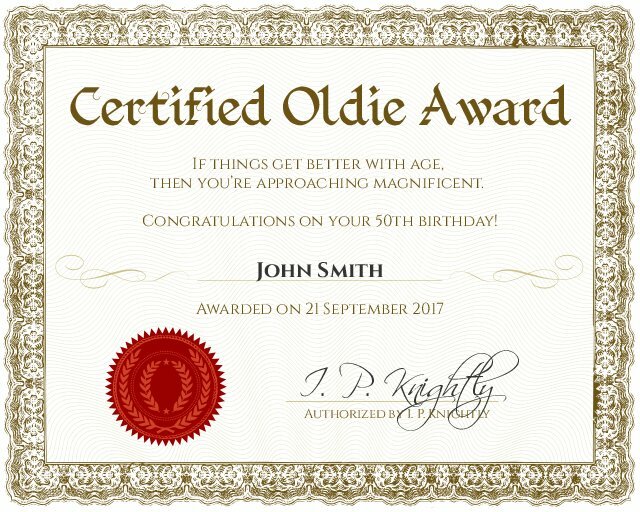 Certified Old Fart. Seen it, done it, can't remember any of it. Awarded to John Smith and authorized by Drew P Wiener (droopy wiener). What size is the certificate? It's in your downloads folder and it's called "Award_Certificate.jpg". If you're having trouble finding it, then I'd recommend to right-click on the final "Download Certificate" button and choose "save link as". Then you can choose exactly where to download the file on your computer. If you have any other questions, or you'd like to request a feature, then please use the handy form below.